In the post dated 16th June 2008, the essential points you have to note under electric potential and electric field in Electrostatics were discussed. As promised, we will discuss some multiple choice questions in this section. The potential difference between two points is the work done in moving unit charge (coulomb) from one point to the other. So the potential difference between A and B is W/Q volt. The work done is negative here because the point B is at a lower potential so that the external agency need not do any positive work. The charge will move to B by itself under the attractive force towards B (and hence the work done by the external agency is negative). The potential of B is therefore equal to V – (W/Q) volt. The separation d between the points serves only as a distraction in this question. Total electric flux from a charge q is q/ε0. Since the charge q is situated at the centre of the cube (fig. 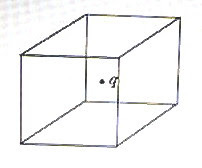 ), all the six faces of the cube have equal share of the flux so that the flux through one face is q/6ε0. Evidently, if the velocity v of the projectile is halved, the distance of closest approach will be quadrupled. The correct option is 4d. (1) A charge +4q is located on the X-axis of a Cartesian coordinate system at x = – 2a as shown. Another charge +(q/4) is located on the X-axis at x = a. Where on the Y-axis should a third charge –3q be placed so that the resultant electric field at the origin O has equal positive X and Y components? This field is directed along the positive X-direction. 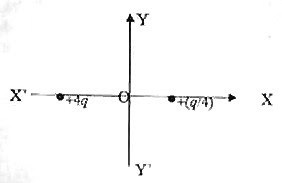 The field produced by the third charge –(3q) should have the same magnitude as that of the above field and should be directed along the positive Y-direction so as to ensure equal positive X and Y components for the resultant field (due to all the three charges) at the origin. This gives y = 2a. (2) A thin non conducting spherical shell of radius R has total charge Q spread uniformly over its surface. 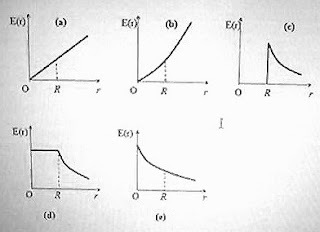 Which of the following graphs represents the variation of electric field E(r) (due to the shell) with the distance r from the centre of the shell? The correct option is (c) since the field inside a uniformly charged thin spherical shell is zero and the fields on the surface of the shell (r = R) and for points outside (r >R) are respectively (1/4πε0)Q/R 2 and (1/4πε0)Q/r 2. The potential at the centre due to the larger and smaller shells are respectively (1/4πε0) q1/R and (1/4πε0) q2/r where q1 = 4πR2σ and q2 = 4πr2σ. Here σ is the surface charge density. In the next post we will discuss some more multiple choice questions. Free response questions will be discussed after that. It is high time that the ideal of success should be replaced by the ideal of service.